There may be cases when you can’t get your hands on a ready-made pepper spray. What if there is a shortage, or some natural disaster or any other form of crisis, including an economic collapse? 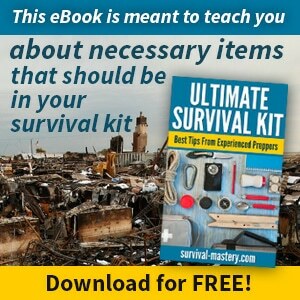 You will need to take everything in your own hands, and eventually may have to prepare your own self defense tools, items and, in our case, a homemade pepper spray. It will help in a variety of cases. 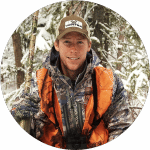 It can protect you from aggressive humans and even from rabid or wild animals. It is still important to note, that if you have respiratory problems you must not prepare the spray yourself. If you still prefer to do it yourself, use extreme caution, have a facial mask and prepare the spray in a ventilated area or room. Otherwise, someone else can prepare the solution for you, and this someone must be a trusted friend or relative. See our article on tips and tricks on how to use pepper spray for more information. 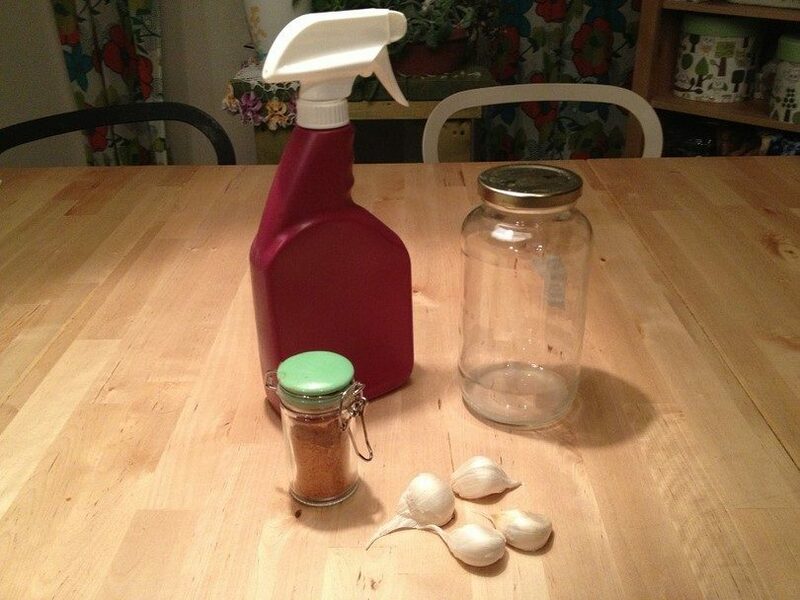 So here is what you need to prepare and do, to have your own homemade pepper spray. As you may be guessing your first step will be to select the appropriate type of pepper or chili. It must be in a dried form. If you tend to grow your own chili, then this is also a perfectly suitable solution. Yet, before you commit to a particular type of pepper, we need to shortly discuss the hotness of each sort. We will use a certain measuring unit for the hotness, and this unit is the Scoville Heat Unit (SHU). Usually, the hotter the pepper, the stronger the effect will be. To start off, the mildest known chili is the Red Cayenne pepper. It is rated at around 30,000, to up to 60,000 SHU. There are several less potent than Cayenne pepper, like Serrano Pepper (about 10,000-25,000 SHU), Jalapeno pepper (up to 8,000 SHU), and bell peppers are rated as the least (if at all) hot. From 50,000 SHU to up to 150,000 SHU we’re getting at the middle index, and you can find the Thai Bird Chili at that range. Next, we’re reaching the high level of hotness. The Scotch Bonnet and Habanero chili peppers are rated at around 100,000 SHU reaching up to 350,000 SHU. The Red Savina Habanero goes as high as 650,000 SHU. 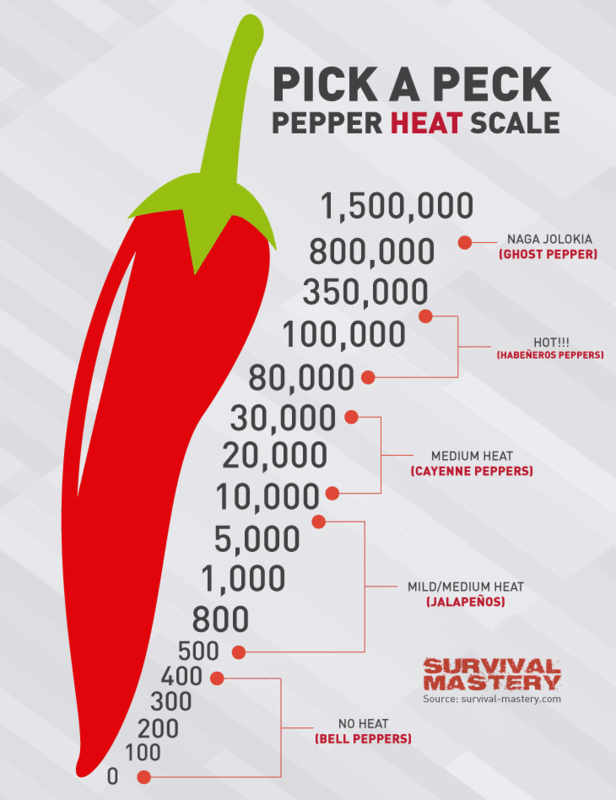 The hottest in this range are the Naga Jolokia Pepper and Bhut Jolokia chili, going above 1,000,000 SHU, to up to 1,500,000 SHU. This is considered as among the hottest chili pepper sorts. Yet, on the scale, the hottest pepper sort known so far is the Trinidad Moruga Scorpion. It’s ranged from 1,500,000 to 2,000,000 SHU. 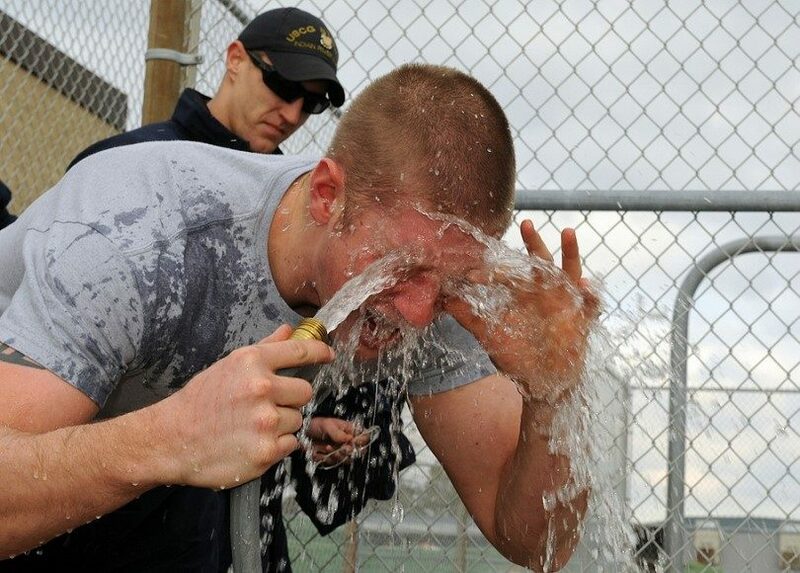 The container can be almost anything that can deliver a liquid in a spray form. You can pick an empty bottle from your toiletry or purchase empty ones from a ‘yourself-store’. Before you fill the spray container with the pepper solution, first inspect it well. Test it with water. Try to spray the water and see if the container drips water from some spot or opening. It must be a reliable spray container, or it may stain your clothes, furniture, and even your hands. If you by accident touch your eyes (and there’s pepper residue on your hands), you may end up with badly irritated eyes. Optional: A third container in case you have some pepper spray solution left. You will need to keep it in a cool place. 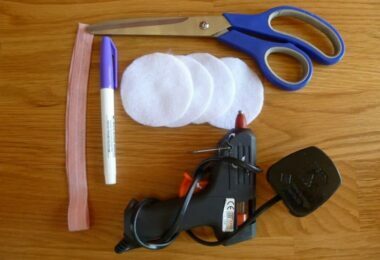 To learn more on how to make other DIY self-defense weapons, see our informative piece on this subject. First of all you need to prepare the peppers or chili by dehydrating them. There is no quicker or more efficient way, so you can use a dehydrator, or you can sun-dry them, or even prepare them on a low temperature in the oven. Either of these methods will do just fine. 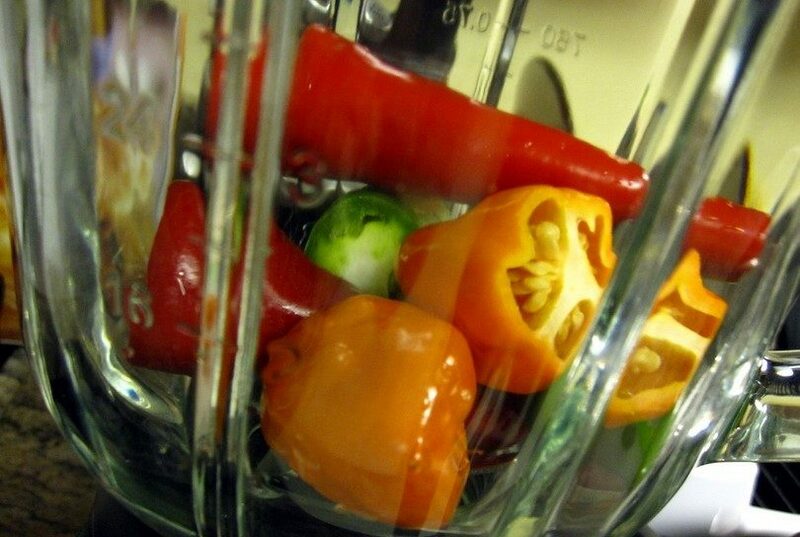 When the peppers are ready and dried, place them in a blender. 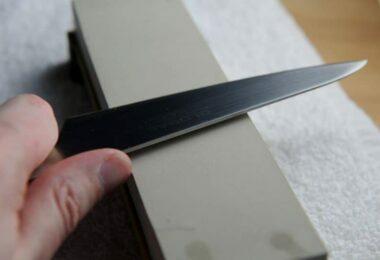 As an alternative, you can grind or chop them (use a vegetable chopper), but make sure they are chopped to as small pieces as possible. Next, it’s time to chop/blend the garlic. Whichever way is possible for you, use that, and make sure the garlic is finely cut. Then take the baby oil and mix it with the ingredients so far, or blend them together in a blender. Then add the vinegar or alcohol (12 ounces) in the blended mixture (or in the bowl). You should aim at a homogenous solution. The mixture must be as smooth as you can get it (depending on what kitchen tool/utensil you’re using). If you use a blender, be careful not to splash the mixture, while you add the alcohol/vinegar. To avoid splashing, add the vinegar/alcohol slowly, while the blender is still working. Blend the mixture for 2-3 minutes. 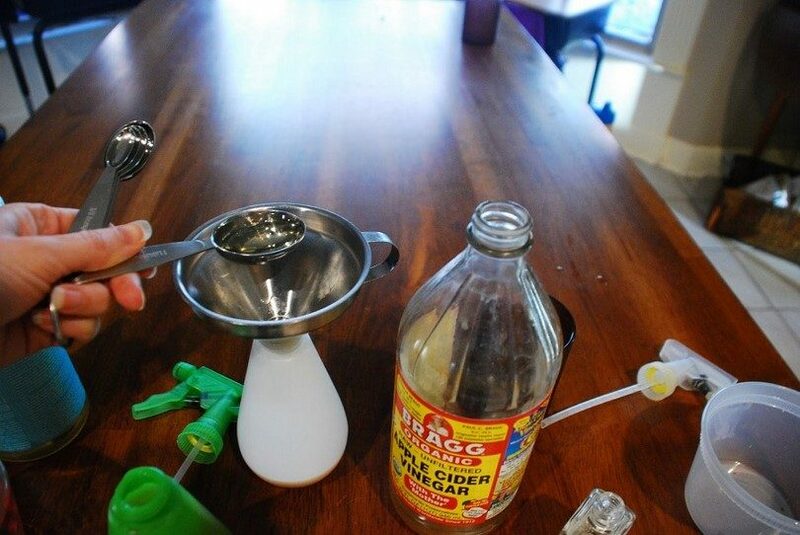 Next, take the funnel and use it to add the solution in the large bottle container. 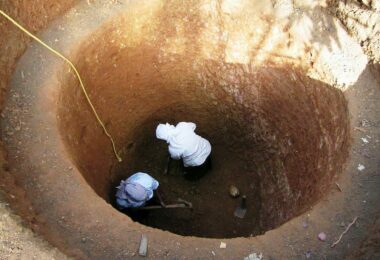 The funnel is always useful in order to avoid splashing or wasting part of the solution. It will help you work as clean as possible. As you transfer the mixture in the bottle container, let it stay during the night, in a cool place. This will also be helpful so that the solution will react with its components and thus the effectiveness will be substantially increased. On the next day, it’s time to transfer the mixture in the smaller bottle container. Again, use the funnel (clean it first), prepare a thin cloth or cheese cloth, and pour the mixture in the bottle. Place the funnel on the bottle and attach the cloth onto the funnel. As you pour the solution in the bottle it will be filtered and poured through the cloth and funnel. You will end up with the main mixture without the pit and seeds. Squeeze the cloth to let more of the solution into the bottle and remove it. A good use for the pit and seeds and other left-overs from this procedure can be effectively used against pests and annoying animals in your garden (if you have one). So finally, the pepper spray is ready and must be stored in a cold place, ideally in the refrigerator. Thanks to the vinegar/alcohol, the solution can last for up to 3 months. Prepare the ingredients first. Take some chili powder or hot pepper powder (consult the SHU measurements above in this article and try to find the hottest pepper). Gather liquid soap, lemon, black pepper, garlic powder and finally a spray container. First, mix the dry ingredients in a separate glass. Then begin adding the liquid soap and squeeze a whole lemon in the mixture. The lemon and soap are both eye irritants and will increase the effectiveness of the end product. The spray container, as advised above, shouldn’t be broken anywhere or if you can test it, make sure there’s no leakage from anywhere. When you’re certain in the safety of the spray container, add the above-prepared solution in the container, and you’re ready. Use it only in a self-defense situation. To see a simplified version of the above recipe, you can watch this YouTube video on making pepper spray. In this YouTube video you can further see the effect of a strong chili or hot pepper solution. You can see that the most important item is the hot chili/pepper and the alcohol that it stays in. It must stay overnight in the alcohol or vinegar solution in order for the effect to be stronger. The chili’s juices and extract will become much heightened thanks to the alcohol/vinegar. Finally, if it’s possible, test the product on yourself or if someone of your closest friends is willing to try it on themselves that would be best. It is always better to know that the spray is strong enough, than to hope that the attacker or offender will be knocked off, but instead s/he just laughs at you and attacks you nonetheless. Also, don’t test the product on anyone who’s unsuspecting or as a joke. It can still cause temporary blindness and irritation. Don’t play with it as a prank or try on animals. Otherwise, we hope it will help you defend yourself against predators and criminals. For more reviews of the best pepper sprays, see our article on this invaluable topic.